T-lymphocyte. 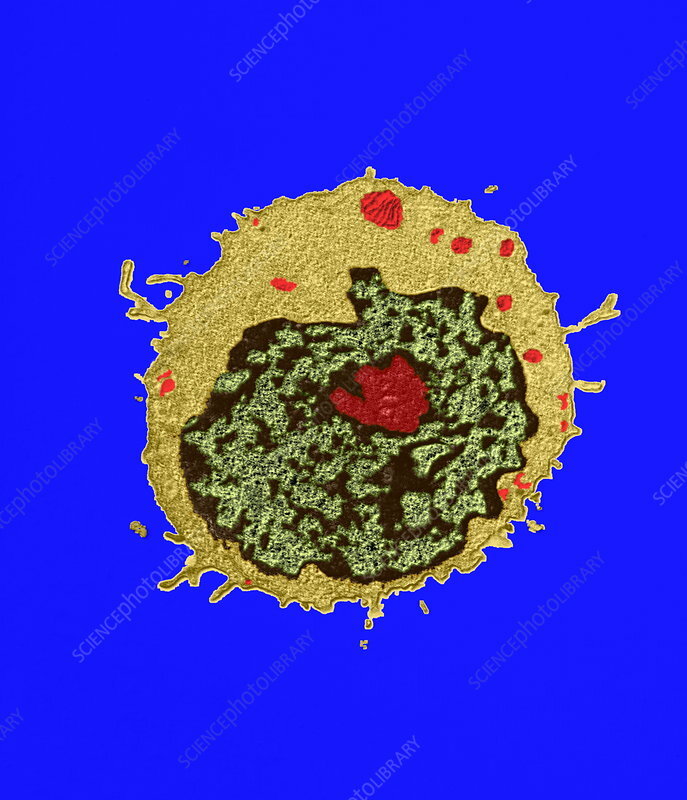 Coloured transmission electron micrograph (TEM) of a section through a T- lymphocyte white blood cell. The cell contains a large nucleus (green/black), cytoplasm (brown) and cell organelles (red). T-lymphocytes are cells of the human immune system. They are produced in bone marrow and mature in the thymus gland. This cell type is susceptible to infection by the Human Immunodeficiency Virus (HIV), the causative agent of AIDS. There are three major types of white blood cells: granulocytes, lymphocytes and monocytes, which protect the body against invasion by foreign substances. Magnification: x10,250 when printed 10 centimetres high.